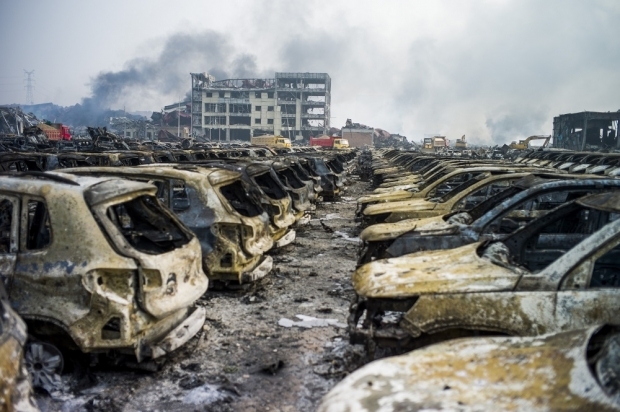 Rows of burned-out Volkswagens near a hazardous chemicals warehouse that exploded on the night of August 14 in the port city of Tianjin, in northern China. Chinese military experts work at the site under growing pressure for authorities to explain the cause of blasts that left more than 110 dead and over 700 wounded. Late in the evening on August 12, a massive chemical explosion shook the city of Tianjin. Days later, the death toll stands at 114 people, though that number is expected to rise as more of the dead are pulled from the rubble. Many of those killed were firefighters and police officers who died fighting the blaze. More than 700 people were injured in the blast, many of them seriously. As The New York Times noted in a story on the blast, “questions persisted about why the authorities had allowed a company that handled dangerous chemicals to operate so close to residential areas.” There are both general and specific answers to this important question. The specific answers, which may never be made public, would include a full accounting of the political connections between Rui Hai International Logistics (the company whose chemical storage facilities blew up) and Party officials, and the means through which Rui Hai (allegedly) evaded full implementation of relevant government regulations. But there is also a more general story to be told: One reason why Rui Hai was allowed to operate as it has, seemingly in violation of Chinese laws that forbid the storage of hazardous chemicals near densely-populated residential areas, is because there are no civil society organizations representing the people of Tianjin that could have pushed back against actors like Rui Hai, and who could have forced local officials to ensure that Rui Hai was following the law. Think about it: In China’s third-largest city, with a population of more than 14 million, there are only a handful of environmental groups. If my experience meeting with environmental NGOs in other Chinese mega-cities is any guide, (and this impression is reflected in the systematic research of sociologist Anthony Spires) the few groups that do exist are tiny, most likely with no more than three or four full time staff. They were unable to push their government to keep a close eye on companies like Rui Hai, despite the fact that some citizens were apparently worried that chemical storage warehouses in Binhai district presented a public health and safety risk. Going forward, local groups may well be afraid to marshal public anger over the explosion to push for change. One expert on Chinese environmental civil society I spoke with noted that the limited responses that she had seen from environmental groups in Tianjin had been “weak.” She predicted that groups in Tianjin would be hesitant to speak out on the tragedy, for fear of attracting unwanted government scrutiny. Of course, the weaknesses in Chinese civil society are not limited to the environmental sector. There are likely few if any local civic organizations representing the residents of the Vanke Port City, and of course we know that the workers at Rui Hai have no independent union representing them to ensure that management follows all health and safety regulations to the letter. Sadly, Tianjin firefighters have no independent union to represent them, to ensure that those injured have their health care costs fully covered, and to offer various forms of assistance and support to families whose loved ones died in the blaze. Even if such groups did exist, they would be unable to get word out on (allegedly) lawbreaking companies like Rui Hai, given that local officials would likely not allow a big employer like Rui Hai to be subject to negative news coverage. Indeed, the local Tianjin television station was widely pilloried for broadcasting Korean soap operas on the morning after the explosion, even as smoke was still rising from the blast site. And the lack of democratic checks on state power means that the political leadership of Tianjin couldn’t be (and won’t be) voted out over its failure to fully and rigorously enforce relevant health and safety laws. In other words, this tragedy shows the shortcomings of China’s governance model, a key component of which is regular trimming of civil society organizations and activists. From the Party’s perspective, regular repression of civil society does have its benefits: as many experts have pointed out, there is no meaningful organized opposition to the Party anywhere in China. But the refusal to allow civil society to develop also has its costs: better governance comes through regular and engaged dialogue with the public. For better or worse, NGOs are the most effective vehicle for that dialogue, and those groups simply don’t exist, either in Tianjin or almost anywhere else in China. Surveying the blast site the day after the explosions, Guo Shengkun, the minister of public security, stated that “deep lessons must be learned” from the tragedy. Minister Guo is right: there are indeed many lessons to be learned. Perhaps the Tianjin explosions will lead the Chinese Communist Party leadership in Beijing to rethink its approach to civil society, and to allow groups to form, to grow and develop, to seek funding from outside China, and, most importantly, to form links with like-minded groups in other Chinese cities. The larger socio-political context in China is pointing toward more restriction of non-government entities in China. It is with this in mind that I have little optimism for Tom’s hoped outcome: that the CCP will come away from the Tianjin disaster with a greater appreciation for the value of public oversight and participation. Instead, we are seeing a repeat of the official response to the Kunshan tragedy one year ago. Control the dominant narrative through directives. Suppress influential inquisitive voices. Focus attention on assistance and support for survivors and families. Deliver swift and resolute justice unto business owners and local officials. Let other news stories dilute the toxic subject until it becomes another disaster among many in the annals of China's industrial era. While I agree with Tom’s insightful analysis of Tianjin disaster being a manifestation of fragile state of checks and balances at the local level, I think it is important to note here that the crisis also has demonstrated the relentless efforts of some societal actors, namely a selected group of journalists, to exercise oversight. The Tianjin TV debacle has garnered much media attention and public scrutiny both in China and internationally, but beyond this incident, a number of in-depth investigative reports already have come out about the crisis, including those published by renowned commercial outlets like Caijing and Caixin, as well as in online media from portals such as Tencent and Netease, and even from some party outlets, such as the Paper. The topics investigated include the offending company’s access to registration permits for storing the toxic materials, its ownership structure, and the reasons behind the deadly fate of the firefighters. More issues are likely to emerge in the days to come. While some of the stories have been censored, a number of them remain accessible, and have been widely shared on Weixin and Weibo. The state’s limited tolerance for these investigations suggests that amidst the increasing censorship, the openings for media supervision or yulun jiandu remain present under Xi. As in the past, some bottom-up feedback appears to be tolerated and maybe even encouraged so long as it doesn’t target the center or instigate public mobilization. In the case of these reports, thus far, they are looking at specific failures associated with the disaster, targeting primarily the company and local officials, though some reports also delved into Rui Hai’s connections with state-owned Sinochem, a topic that touches on central-level interests. The Tianjin disaster further demonstrates that China’s media landscape is becoming increasingly dynamic, with new media and official outlets brushing up against the boundaries of the permissible, previously the near-exclusive domain of news outlets such as Caixin and Southern Weekly. This leaves some hope for the state of investigative reporting, which many have argued has been in decline since the 1990s. Whether media reports facilitate some systemic change remains to be seen. My analysis of media investigations under former President Hu Jintao found that whilst the center responded to investigations with visible appeasements to public demands, such as by carrying out school reconstructions in the aftermath of the Wenchuan earthquake in 2008, the more difficult questions concerning accountability either gradually were zoned out or were kept at a superficial level. This time, however, media reports are reinforced by an increasingly demanding and distrustful public opinion. How far the leadership will go in exercising accountability is something to watch closely as this crisis unfolds.